Before and after photos from our church steeple work! What a difference! See God in our midst. Be the Love I need to see in the world. Be a source of healing. These are ten of the 107 (+) personal mission statements you wrote last week and we “planted” in fellowship hall this week. Your commitments are beautiful – your missions of faith, hope, love, justice, service, kindness, patience, and more brought Sandy and me to tears as we read them, prayed over them, and “planted” them on the wall. Surely God is doing big and holy things in our community! (If you missed church on Sunday, don’t worry – we have seeds waiting for you and your mission statements downstairs). I hope to see you Sunday! And if this long weekend calls your family out of town and you won’t be in worship, I hope you will pause on Sunday to pray, give thanks, and do something worshipful wherever you find yourself. 4. our worship services are online! For now, it’s just the scripture reading and sermon. We are working on getting the proper licenses so we can post music, too. Click here to listen to last week’s message! 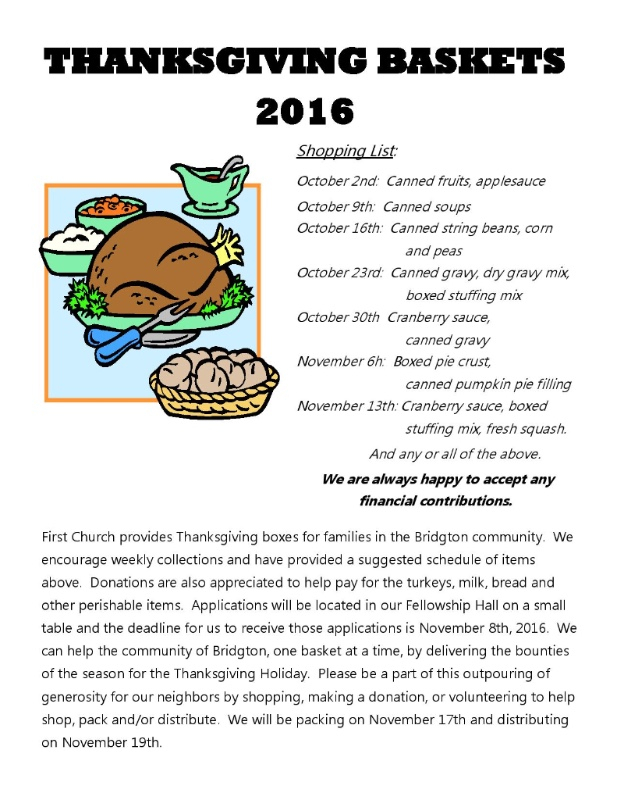 This Sunday (October 9, 2016) we will receive the Neighbors in Need offering, which supports the UCC’s ministries of justice and compassion throughout the United States. Two-thirds of the offering is used by the UCC’s Justice and Witness Ministries to fund a wide array of local and national justice initiatives, advocacy efforts, and direct service projects. Through ucc.org/justice, our national Justice and Witness Ministries office offers resources, news updates, and action alerts on a broad spectrum of justice issues. Working with members of the UCC Justice and Peace Action Network (a network of thousands of UCC justice and peace advocates), Justice and Witness continues its strong policy advocacy work on issues such as the federal budget, voting rights, immigration, health care, hate crimes, civil liberties, and environmental justice. Neighbors in Need also supports our American Indian neighbors in the UCC. 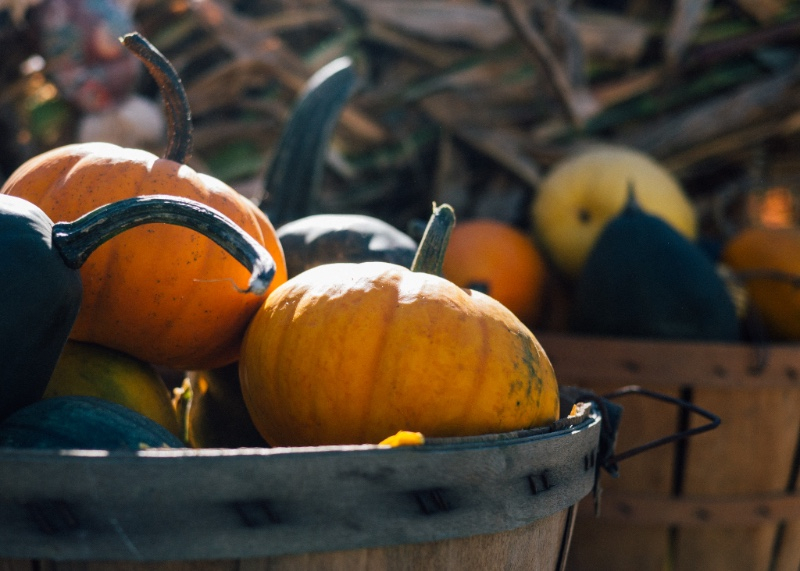 Save the Date for the Mission Team’s Free Harvest Dinner, “Celebrating our Bounty with Emily!” on October 24 at 5:30pm. Get your (free!) 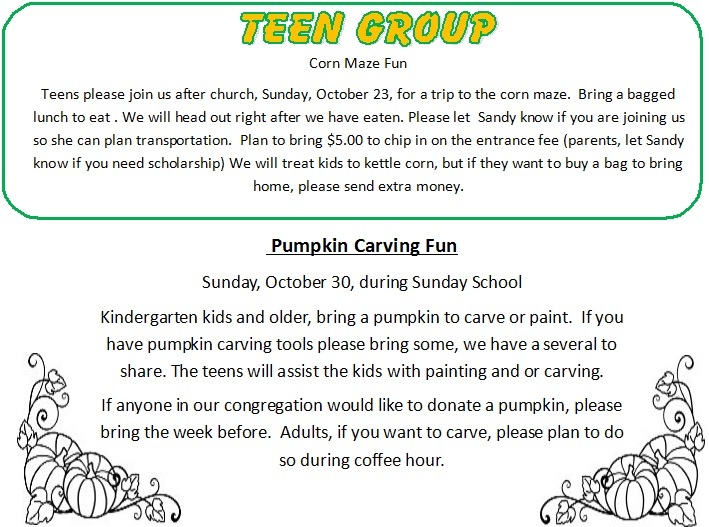 ticket from any mission team member on Sunday – Debbie will be set up at coffee hour this week to hand out tickets. Menu is pork tenderloin, “broasted” vegetables (come to find out what that means!) and apple crisp. This dinner is a gift to our church family from the mission team, and is our way to say thank you for all the good mission work our church does! Come join for a delicious and fun evening. Beginning Tuesday, October 25th the ladies that study and pray each week are seeking new prayer/study partners! 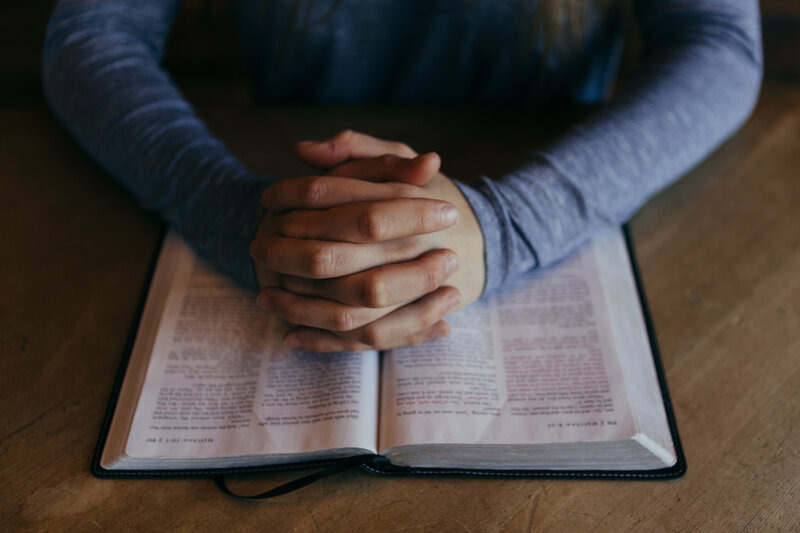 If you’d like to learn more about the power of prayer and improve your prayer muscles, please consider joining us from 1:30-3:00 pm in the church parlor. 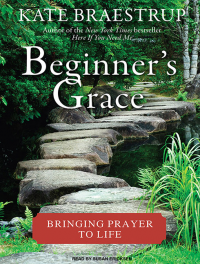 The next book we’ll be studying is “Beginner’s Grace: Bringing Prayer into Your Life”, by Kate Braestrup, a New York Times best selling author and one of the first chaplains ever appointed to the Maine Warden Service. Each Tuesday we read, have lively discussion and pray for others. If you or someone you know are in need of prayers, please let us know. Thanks, Joan Bosworth, Dale Brown, Cathy Finck, Barbara Mayo, Karen McNutt, Carol Riley. Do you know that our church pays $17 in dues for each of our church members to the United Church of Christ? This money is used to help fund our conference. Our church has benefited hugely in recent memory from the support of our conference through helping us find interim and bridge ministers, supporting our search process, and helping us to grow into our next chapter as church together. The conference will continue to support us in the coming months as we transition into our new relationship with Emily, plan to install Pastor Emily as our pastor, and as she seeks standing in the Maine Conference. If you’re able, our council asks that you please consider making a $17 donation to cover your membership dues and help fund this important work! Our Mission Committee is working on a cook book – please bring recipes to any mission team member, to be added to our church cook book! Cook book will come out sometime in 2017. – We have approved the fabrication of all new Roman Numerals and minute markers to be constructed out of mahogany. That’s 270 pieces hand cut, sealed, primed and painted! Each will be reinstalled with countersunk stainless steel screws. 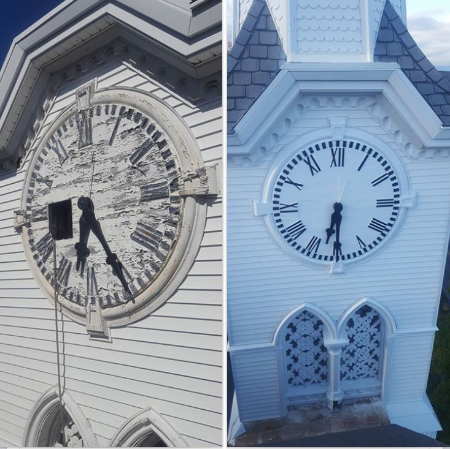 The clock hands themselves will be refinished. – The very top of the weather vane spar rod will have a custom fabricated steel plate “bushing” lagged into the structure of the steeple itself. The lower end of the spar rod has been reinforced inside the steeple with climbing points doubling as additional structural rigidity of the steeple itself. – From a decorative standpoint three copper balls ranging in size from 14″ to 8″ and finally to 4″ will make up the top of the steeple. Each will be gilded as well (gold leaf). The weathervane itself is being remachined and restored and will also feature gilding on the compass points, N,S,E,W, and the weather vane arrow and feather. Everything else will be refinished in black. – The scope of work has expanded to include the small steeple as well and will require remaking the steeple top ornament which will also be gilded mahogany. – There is aprox. 40 linear feet of custom mouldings being replicated to replace rotted areas. All will be sealed, back primed and painted. – Areas of missing light gauge metal flashing will be matched and installed as needed. – Previously improperly flashed roof panels will receive fully adhered EPDM rubber roofing together with proper flashing terminations to ensure the tower bell area remains watertight. This work can only be viewed from a lift or very briefly from a parachute! This project is very near and dear to Anne and I in honor our parents. We are very blessed indeed and this last project caps the efforts of so many that have helped restore and preserve this sacred place. Devotional or inspirational reading and prayer for our church family. Starting October 25, we will begin reading “Beginner’s Grace” by Kate Braestrup. 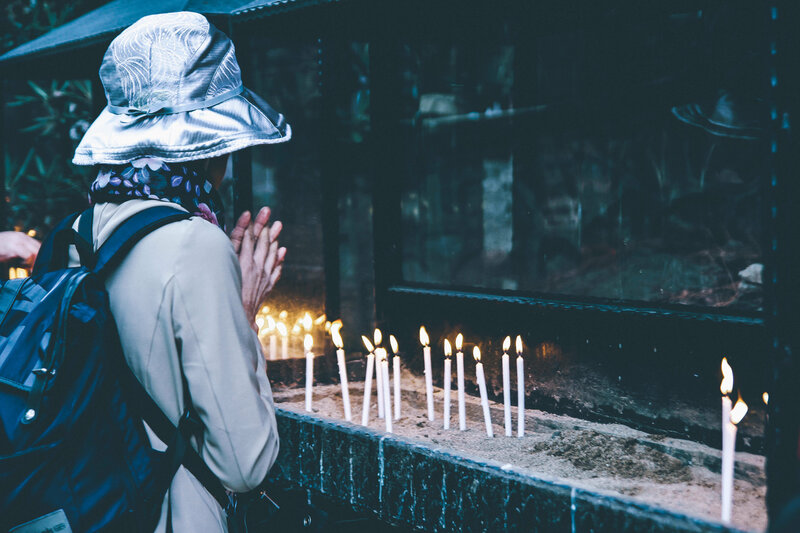 If you’ve been thinking about exploring your prayer life, consider joining us! Our current study is a biography of Peter by Pheme Perkins, a professor at Boston College. This study is based on the various Gospels and the book of Acts and seeks to find out who Peter was and the role he played in the formation of Christianity. Please feel free to join us if you’ve ever wondered about Peter and his influence on the early church. Jordan Vigna…Russell Sanborn…Jimmy DeAngelo…Richard L. Gyure II…Steven Milton, Aaron Lewis son-in-law of Mary Stichfield and Brian Cushing has arrived home safely from Afghanistan. Others are still serving there.